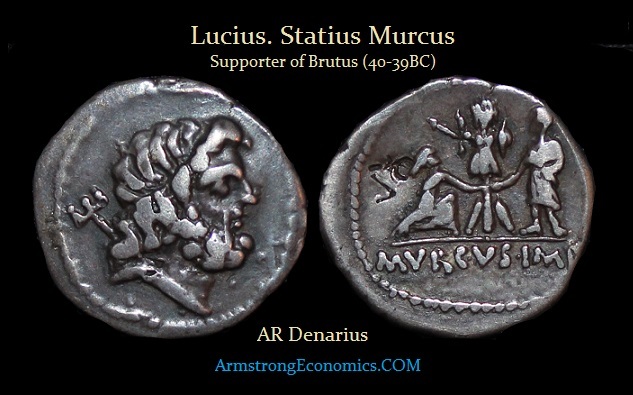 Lucius Staius Murcus was a legate of Julius Caesar in Gaul between 48-46 BC. In 44 BC, he was given the proconsulship of Syria. Following the assassination of Caesar, he was proclaimed Imperator in 43 BC following the surrender of Bassus at Apamea. He then joined the assassins and took command of a fleet under Brutus and Cassius. After the defeat of Brutus’ forces at Philippi, Murcus fled along with many others, including the son of Cicero. They managed to make it to Sicily where they joined the pirate son of Pompey the Great, Sextus. For some reason, Murcus fell out of favor with Sextus and was murdered in 40 or 39 BC.